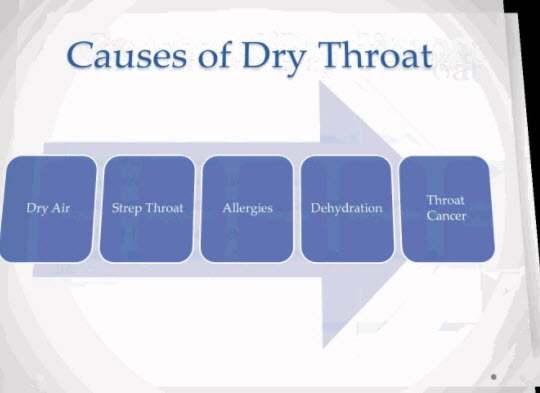 Dry throat occurs for many reasons which are mostly minor, but sometimes can result from a more serious underlying condition. Allergic conditions, like hay fever and others, may cause a dry throat. There are medical treatments and home remedies available for a dry throat. It is a good idea to see a doctor if symptoms last for longer than 1 to 2 weeks. Around 30 to 40 percent of the world’s population is affected by allergies. When a person has seasonal allergies, substances in their environment cause their immune system to overreact. Dehydration is caused by not drinking enough water. The common cold may cause a dry or sore throat, alongside a runny nose or sneezing. The common cold is a term for an infection that is caused by one of several different viruses. A dry, scratchy throat may be a symptom of mononucleosis. This is a disease that is usually caused by an infection by the Epstein-Barr virus. It is most frequently passed on through a person’s bodily fluids, with saliva transmission being very common. Mononucleosis is commonly known as mono or the “kissing disease.” It most often affects teenagers and those of college age, but a person may catch it at any time in their life. Mono typically lasts 2 to 4 weeks, but for some, their body may take longer to recover. The proper name for this condition is gastroesophageal reflux disease, abbreviated to GERD. It causes acid to come up from the stomach into the food pipe. A dry throat may be a symptom of tonsillitis. This is inflammation of the tonsils, which is commonly caused by infection with a virus but can also be caused by bacteria. The tonsils are fleshy lumps at the back of the throat that help fight infections. A dry throat may be a symptom of strep throat. This is a throat infection that is caused by the bacterium, Streptococcus pyogenes.